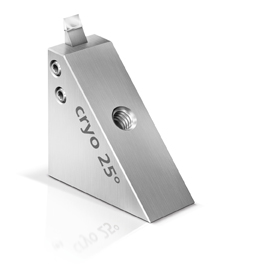 The cryo 25° knife is designed for sectioning frozen hydrated specimens. 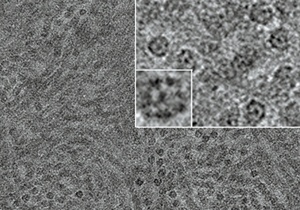 The 25° angle results in the least possible compression and the best structure preservation (H.M. Han et al., Journal of Microscopy, Vol. 230, Pt. 2, pp. 167 – 171, 2007). Please note: best results are achieved at low humidiy, when the cryo-ultramicrotome is placed in a glovebox and the sections attached by electrostatic force (J. Pierson et al., Journal of Structural Biology 169, pp. 219 – 225, 2010). High resolution electron micrograph of vitreous section of keratin intermediate filaments in the midportion of stratum corneum of human epidermis. The fine structure of the keratin filaments is well resolved and their molecular organisation is seen in favourable cases (inset). Ashraf Al-Amoudi, Laboratoire d'Analyse Ultrastructurale, Lausanne.